I’ve never really been quiet when it comes to the lack of live-action family films these days. Growing up in the ’90s there were a plethora of them. Over the past decade or so there has been a steep decline in this sub genre with studios opting to make animated films instead. It’s somewhat understandable since they’re more reliable when it comes to making a profit, as seen by the success that Pixar and Dreamworks have had. But there’s just something to be said about watching actual people on screen deal with their problems. Especially as children, it kindles our imaginations because if we see it happening to them, it could happen to us too, right? And when done correctly they can really be memorable. While this film is only partially animated, it takes place in the real world with live-action humans. 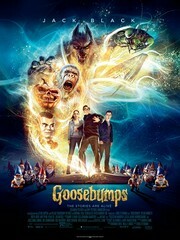 In Goosebumps, the motion picture based on R.L. Stine’s enormously successful children’s book series of the same name, Zach (Dylan Minnette) and his mother move to the suburban town of Madison, Delaware. Zach gripes a lot about there being nothing to do in his new city until the mysterious homeschooled neighbor girl (Odeya Rush) befriends him and he develops an interest in her. One night he’s led to believe that she may be imprisoned by her own father, a fictionalized version of R.L. Stine himself (Jack Black), and sneaks into her house. He discovers a bookshelf full of Goosebumps manuscripts which he decides to explore. Opening the first story releases a 10-foot tall abominable snowman who starts wreaking havoc throughout the town. Eventually, one by one, each story gets opened up with the books’ respective monsters coming to life trying to kill their creator, Stine. Some may consider it a bad thing, but this movie does a great job of not holding back any scares. Adults shouldn’t have too hard of a time–although certain monsters may tap into your own personal phobias–but it will definitely haunt many children. But that’s what makes Goosebumps so appealing. It keeps the visuals acceptable, but never tones itself down. When I was little we had the anthology television show Are You Afraid of the Dark? which still creeps me out as an adult. Goosebumps is frightening, but it’s a harmless scare. It provides us with the same macabre tone of the novels–probably much to the dismay of some of the parents. It gets most of the character background out of the way early on in the first third of the film, which gives itself room to run free for the last hour or so. However, it lets most of that information sit idle for the rest of the film–some of which never really gets revisited. The movie hits its stride about 20 minutes in when we start witnessing Stine’s creepiness first hand and the books start coming to life. We are dying to know why it’s happening and how to stop it, and that information may be given away a bit too easily. But not to worry because, in true R.L. Stine fashion, we still get our fill of twists throughout. What this film does really well, albeit stylistically inconsistent at times, is make us laugh. The humor works well on both adult and kid levels. It’s really a funny movie and it does so without becoming too irreverent. We still feel like something’s at stake, but the jokes help to lighten to the tone on the scarier elements of the film. I think one reason why live-action family films have failed in recent years is because filmmakers have lost touch with what makes kids laugh. They know kids want to see something really outrageous that they would only be able to see in animation, but I think this film may be on to something by aiming the jokes back up to the grownups and not dumbing them down. It doesn’t fall back on cheap slapstick or fart jokes to get laughs–it’s gets them with some pretty solid comedic timing and by finding cleaner versions of the humor that’s popular in recent R-rated comedies. Goosebumps may not be a Best Picture nominee, but it’s extremely enjoyable and acts as a great tribute to R.L. Stine’s famed franchise. It elicits our imagination and does so through the medium of literature. And there is also a nod to Steve McQueen’s The Blob, which is one of my favorites. Although I would have liked to have seen just a handful of stories explored in depth rather than all the stories being briefly touched upon with highlights on maybe 3 or 4, I’m sure the future sequels will do a better job focusing in on one or two stories. Despite the slightly rocky pacing and the minor, yet sloppy, plot holes, Goosebumps will please fans of the book series and will bring adults back to the days when their imaginations weren’t so jaded. Hopefully the success of this film will help set the trend for a return of live-action family films.